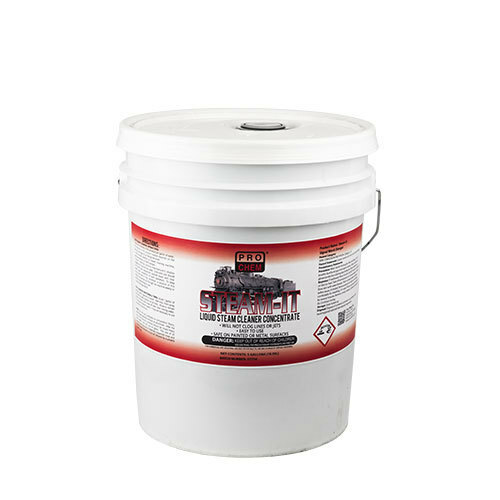 Steam-It | Pro Chem, Inc.
STEAM-IT is specifically formulated and manufactured to cope with problems encountered in various steam cleaning operations. As little as three ounces concentrate per gallon of water makes a cleaning solution that will penetrate and remove all types of grease and grime normally encountered in steam cleaning applications. Low foaming penetrants and boosters quickly cut dirt and emulsifiers retain and float away residue. Unlike hard to dissolve powdered cleansers that must be premixed, this product will not clog jets or lines, causing expensive and time consuming breakdowns. STEAM-IT can be used in many applications, such as cleaning houses, brick, or engines, and degreasing vehicles. For steam cleaning operations: Mix 3-8 ounces of this product per gallon of water. The dilution of this product needed depends on the density and type of soil being removed. Add diluted solution to steam cleaning machine, pressure washer or hand sprayer. Steam cleaning machine manufacturer’s dilution suggestions may also be used. See label for directions on keeping steam cleaner lines clear and in top condition. For cleaning whitewall tires: Dilute one gallon of product with 3 gallons of water. Wet tires, then spray or brush diluted solution on all tires. Allow to remain a few minutes, then hose off with clear rinsing water. Note: Do not use undiluted on composition floors, water-based painted surfaces or aluminum. Do not use on glass. If used in federally inspected meat and poultry establishments, use must be followed with a potable water rinse. After use of this product, surfaces should be rinsed freely with water.